When electricity is applied to a magnetic fan motor it makes the fan spin, but did you know the reverse also true? If you spin the fan blade backwards it produces electricity. Water pressure is energy, and by using the pressure and flow created by gravity found in places like common water pipes to spin the fan, it transforms the simple water pipe into a generator. The flowing water becomes the motor to spin the fan, and the magnets in the motor once used to motorize the fan, are now the generator of electricity. The terms “generator” and “motor” are essentially the same thing. What you name it depends only on whether electricity is flowing into the unit or derived from it. Once generated, the produced electric power is sent to the grid. It is really that simple, and delivers flawless, renewable green energy. The idea of using a Rim Driven propeller has revolutionized the marine world. With the absence of a central shaft and no couplings, a simplified, compact, efficient propulsion emerged. The use of permanent magnets makes the motor and propeller act as one, eliminating the need for transmission gearing as well as separate motors and shafts. 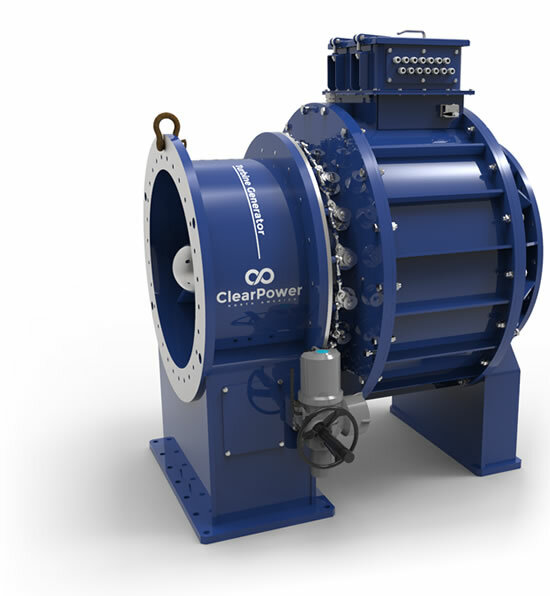 It is a simple design allowing for improved efficiency while limiting noise and vibration, virtually eliminating hundreds of moving parts and replacing them with one single rotating driver. It is an electric fan, for water propulsion. 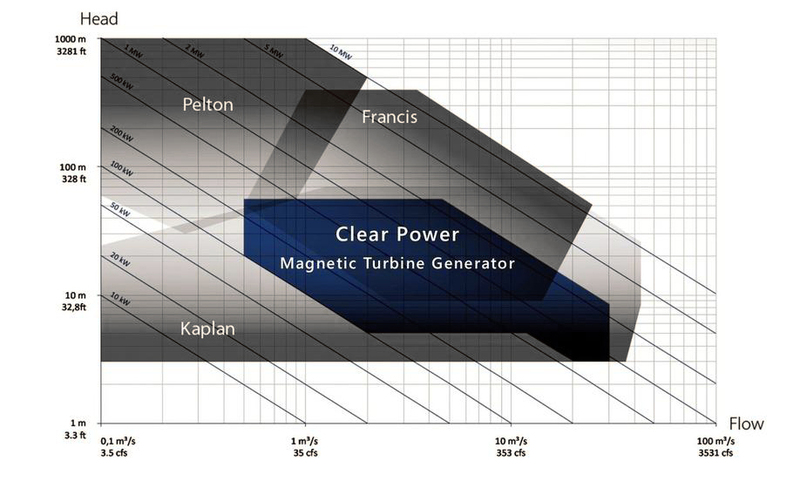 Our Turbine Generator will innovate harvesting energy from moving water unlike ever before. The simple design, and easy bolt on installation will revolutionize the small hydropower market, and stop the waste of energy formed from century old technologies such as braking pressure with relief valves, building costly structures and even the need for a dam to increase head pressure can be eliminated. All that is needed is a pipe, water flow and pressure to standardize generation of hydroelectric power. 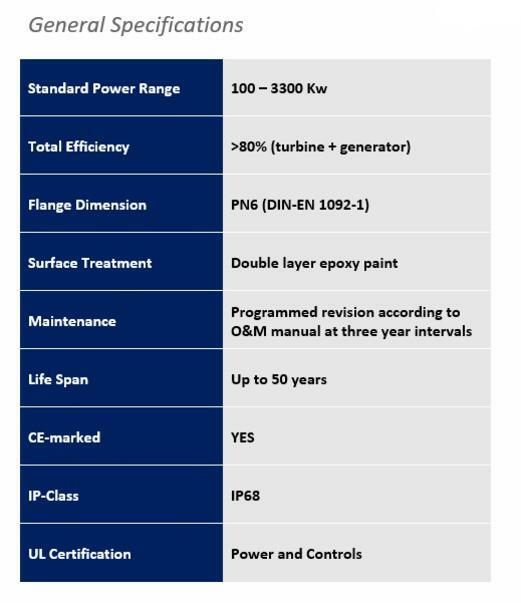 Typical outputs from low pressure/High Flow range from 100 kW to 3000 kW. 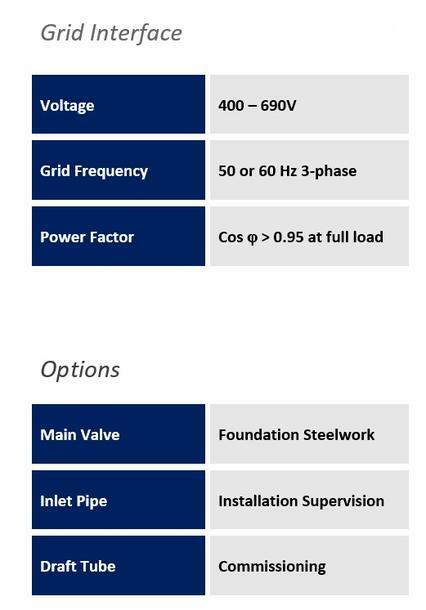 Use the project calculator to see a possible combination of ClearPower units for your site.